Attendance Time Tracker generated from Time Attendance Software. Simple Online Employee Attendance Management system to track employee attendance. Online Attendance Time Tracker with a simple calendar, Attendance management software tracks both calendar and timesheets. Daily attendance like a time card with our Timesheet Attendance Tracking Software. Employee Timesheet Attendance Calculator using daily and holidays calendar. Free Online Attendance Tracking Software and Free Online Attendance Software for Individuals and Freelancers. Simple Online Attendance Tracking Software manages calendar taking annual holidays, sick leave and public holidays into account. A low budget attendance software available with time tracking software for part time, full time and contingent workers. Attendance Software can simply be taken from the built-in timesheet software engine. All the facilities for timesheet software regarding attendance are provided by the attendance helper. The main functionality is to help human resources and the management to maintain resources effectively especially related to timekeeping and the attendance keeping. As described before there two manual timesheet attendance engine and automated timesheet attendance engines are built into the system both enabling senior management to monitor, manage and audit employees’ details. It provides all the essential information for payroll, project cost and the attendance itself. Line manager, Individual, senior management and Admin can view and amend their attendance which can be used for Payroll, holidays and Activities. Attendance Software business rules have a built-in algorithm to determine full day, half day or absent. Which is recorded and persisted like an attendance register. Every employee and management have their own calendar where they can visually view and monitor their track records. Online Attendance Software provides a line manager, admin or management to override attendance which is smart and flexible. It enables team leader, HR, and manager to monitor staff sick, leave and attendance. Public holidays vary from country to country and organization to organization. Our software incorporates bank and public holidays. It allows you to enter public bank holidays on year by year basis to suit and meet organization needs. This intelligence attendance module colour codes the attendance allowing a simple and intuitive interface. Furthermore, it allows leaves to be assigned to an individual resource. Responsibility for monitoring and adjusting the calendar is twofold. An employee can adjust as per day and time attended or management can override it. It can be managed by resources or line manager including human resources online. Online Attendance Software has built-in leave management which can be subscribed by an individual user or line manager. Online functionality is available all the time and anyone can update attendance at any time. 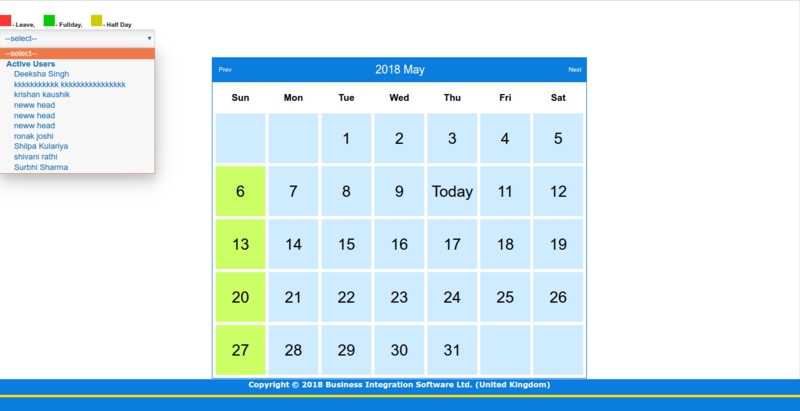 Business Integration Software Ltd is offering Free Online Attendance Software for small businesses, freelancers or individuals to try and see functionality before committing it further. There are a number of specialized features is embedded which makes it our software better suited for the market. In the automated mode when the timesheet is submitted online attendance software will automatically work out where full-day, half day or a number of hours worked and update the calendar. All calendar activities are visually available on the attendance panel and can be viewed in the real-time. All the data related to the time entry can be converted to a number of days attended. When time entry is registered, project or resource data can be stripped and interpolated for payroll and resource management budget. Attendance data provides sufficient information to the payroll system to carry out the weekly or the monthly or even daily billing. Timesheet Calculator can extrapolate cost information which further can be made available to the senior management and the executives for further analysis. Online Attendance Software has built-in Activation and deactivation facilities where when any resource terminates then it can be expired. With all these features above it makes it affordable Online Attendance Software. Time Attendance Software is part of the overall timesheet software where time attendance is stripped from the overall time entries and used for attendance facilities. Time Attendance Software is specialized software for management to view time attended and days attended from a different perspective. It allows management to get bird’s eye view on the project and the resources. Time Attendance Software allows management to measure performance in terms of days worked and results achieved or a number of hours worked and the results achieved. It serves both concepts Time Management and Attendance Management. Time Attendance Software works in conjunction with the timesheet calculator and the attendance software. All the data entered by the employee is fed into the persistent store to be analyzed later. An important task scheduler calculates overall billing, resources and overheads cost which can then be analyzed globally by the accountants and other associates giving a business vital piece of information. Time Attendance Software is very granular all the entries striped according to the business rule and validation and then is used for processing. All the data has gone through the cleansing process before being applied by the time attendance engine. It makes our software one of the advanced software with affordable price with the rich functionalities.